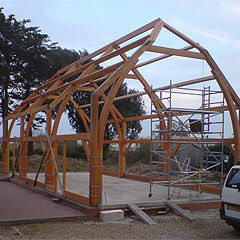 Norton Garden Structures, the trading name of Stan Keeler, has been designing and building high specification structures for the garden since 1995. Until recently all work has been based upon individual commissions for clients, covering virtually all the type of structures you would expect to see in a garden, but each being a unique design for a client. Examples of past work can be seen in the 'Bespoke Garden Products' section of this site, with a brief explanation of materials and construction. 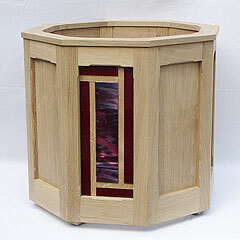 Based upon some 15 years of experience in designing and building structures, a number of standard products are being introduced, the first of these will be an octagonal oak planter which will incorporate the use of 'Art Glass' in the design to produce a planter that is a little different. 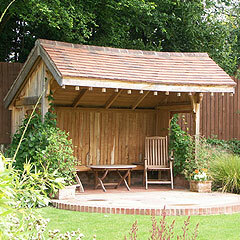 Further information can be found in the 'Standard Garden Products' section of the site. 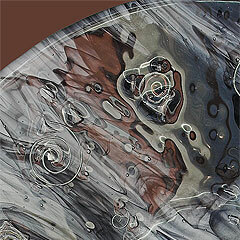 In addition to using 'Art Glass' in the planters, bespoke designs in glass will also be undertaken and further information on this can be found in the 'Art Glass Products' section. The last section of the site, 'Norton Studios', tells the story in pictures of the largest project undertaken, which is the construction of the home of 'Norton Garden Structures'. I trust you will find the site both informative and useful in helping you to enhance your garden.